5 reasons to study abroad (while you’re abroad)! Alright, I’ll admit it – I’m not an international student, and before I went abroad last semester, I’d lived in the same house my entire life. But I do have a lot of international friends, and both their experiences and my own have given me some solid insight into why you should go abroad, even if you’re already abroad at Leiden University. So here are 5 good reasons to pack your bags and move to a new country, that go beyond the typical ‘boosting your CV’ and ‘escaping Dutch weather’. You get to experience a different university system. While it might not be the most exciting reason to go abroad, it can be extremely valuable to study at a different institution. Leiden has its own particular methods when it comes to teaching, course contents and general atmosphere; whilst Leiden really encourages independent, critical thinking, and self-discipline, not all universities are the same. During my time at William & Mary, I had to get used to having lots (I really mean lots) of mandatory classes and therefore losing some of my independence. I also noticed that students there were less likely to openly challenge teachers; this made me realize how special it is that at Leiden University, we get the opportunity to engage with teachers in a very open classroom environment. On the other hand, being at William & Mary helped me learn how to effectively deal with time management and how to really actively participate in class, plus it brought out my inner nerd. Gordo the therapy dog: best way to relieve exam stress! 2. You get to make even more international friends. Of course, if you’re an international student, chances are you’ve already surrounded yourself with an amazing group of fellow internationals. But one of the great things about going abroad is getting the opportunity to network and come into contact with people from all different spheres of life. Networking in The Netherlands isn’t the same as networking in the U.S., for example. Going abroad might just land you that internship or dream job you’ve always wanted. 3. You get to travel. This seems self-explanatory, but a lot of people forget how much traveling you can get in when you study abroad. During my semester in the U.S., I visited Baltimore, Philadelphia, Washington D.C., New York City, New Orléans, Chicago, Portland, Seattle, San Diego, Los Angeles and San Francisco. Especially if you have a lot of free time, studying abroad gives you the chance to see even more of the world. 4. You get to start over. Perhaps one of the most valuable parts of going abroad, is getting to start over and experiment with who you are and who you want to be. 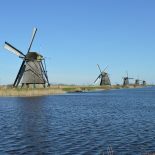 Sure, you’ve already had this chance by coming to Leiden University in the first place; but how great is it to do that again, and getting to apply all the knowledge you’ve already obtained during your time in The Netherlands? 5. You get to escape Dutch weather. I really wasn’t going to add this one to the list, but let’s be honest; wanting to escape the gray skies and rainy weather is a totally legit reason for wanting to go abroad! When I was in Virginia, I frequently went outside without a jacket on – in DECEMBER (!!!!!). It was amazing. Thank you for reading, and please feel free to comment or contact me. For more information about studying abroad, please go here. Stay tuned for my next post about studying abroad. This entry was posted on March 30, 2016 by Roxy in Roxy, Study, Travel, Uncategorized and tagged culture, going international, international student, semester abroad, study abroad, travel, united states.